I’m just back from a flying visit to New York. 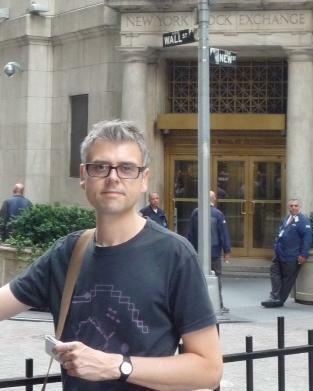 It was my first time there, so in the name of research I went to Wall Street to see what it was like. I’d already mooched around Midtown & Uptown & had become used to the grid system, the sky scrapers; the picture-postcard view of New York, so it was a bit of a shock, and a bit of a disappointment, that Wall Street is more like London than NYC. Narrow streets, UK-sized office buildings and no grid pattern, just strange shaped corners and haphazard streets. I know that the reason for this is that Manhattan was built on at the southern tip first, and that early adopters tend to throw up their buildings before the Town Planners have arrived, but it does seem like a wonderful metaphor for the finance system, which (to my un-academic eye) is based on the fact that if you conglomerate thousands of irrational decisions the overall result is somehow rational, and so needs little regulation. Regulation of the town planning in the rest of NYC has made it simple to understand and get around, whilst still allowing for interest and individuality. Discuss? Previous Post How do you solve a problem like the banks?